"Last Land",this video work was made on location at the North edge of Japan - Shimokita peninsula is already imprinted in a collective consciousness as the "edge of the Japan". In my opinion, it means to free from social and political formations, and they might be a symbol of new possibility. In this place, making a video of tuna fishing in which is a kind of journey for inner world, tuna is the one of the biggest fish and quite precious one in Japan. Therefore, tuna is a symbol of unexpectedly idea. This video exhibits long time in a day, as same time as my real shooting in the sea. The images of the rough sea make visitor feel sick, so visitors hardly keep watching the image. 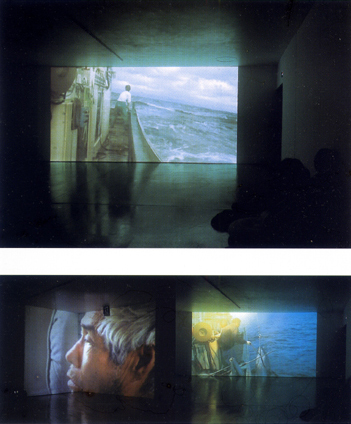 I make what is reality to tuna-fishing for us and also make us realized the distance between real and the image. I try making real nature scene and relationship both side.